If you read GL, you know we've written quite a few items over the last year or so about the awful condition of the boardwalk in Coney Island. GL has learned that the city was sued seven times in 2005 and 2006 over injuries that occurred as a result of fall due to the boardwalk and settled nine other cases. We don't know what the total bill to taxpayer's has been because of the Parks Department's failure to keep the boardwalk in good condition. 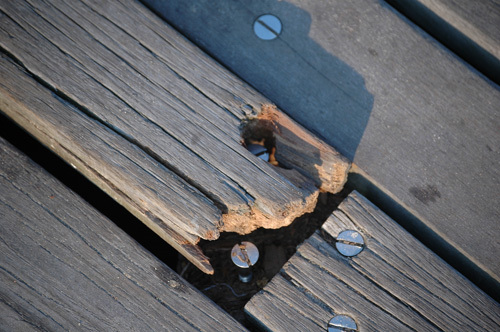 The Coney Island Boardwalk--other than the very small portion that was replaced for $500,000 over the winter--is in a disgraceful state of disrepair. We're not talking about a couple of loose boards here and there, either. We are talking about it being in such a sad state that all an ambulance chasing lawyer has to do to get new clients is find a particularly odious part of the boardwalk and stand there and wait for people to trip and fall. These spots are easy to locate. They're the ones where boards are see-sawing up and down as people walk on them or where there are holes where the wood is rotted or where bolts are sticking out. Repairs seem to have started on a small segment of the boardwalk near Astroland this week. Just last night, we were walking on the boardwalk and felt boards sagging under our feet. We looked down and saw you would fall least six to eight feet in that particular spot and wondered how long it will be before the boards split open and someone plunges through. The good news is, the victim will be able to sue or the city will settle!